TK-421 was the designation of a clone stormtrooper stationed aboard the first Death Star. At some point in 1 BBY, TK-421 went off-duty and went to the Star Tours interstellar travel agency for unknown reasons. His bag was eventually discovered by G2-9T during baggage checks, and upon learning of who it belonged to, decided that TK-421 might have good reason not to be at his regular post before clearing it. After the Millennium Falcon was captured shortly before the Battle of Yavin, he was ordered to stand guard in front of the freighter's boarding ramp, while a scanning crew attempted to determine if anyone was hiding aboard the Falcon. Just seconds after the scanning crew had made their way up the boarding ramp, a loud thump was heard and someone (Later revealed to be Han Solo) called down to them, asking TK-421 and his fellow guard, TK-422, for help with a piece of equipment. The two stormtroopers made their way up the ramp to assist the technicians; both troopers were ambushed by Han Solo and stripped of their armor to conceal Han and Luke's identities aboard the Death Star. Lt. Pol Treidum (observing from Docking Control Room 327 that TK-421 was absent) attempted to contact the stormtrooper, asking (via comlink) why he wasn't stationed at his post. Luke Skywalker (having disguised himself as TK-421 by that time) concealed TK-421's current status by motioning to his ear to imply that the comlink in his helmet must be broken. After the battle of Detention Block AA-23, a security team was dispatched to the hangar housing the Millennium Falcon where TK-421 and his comrades were found unconscious aboard the Freighter. He, along with TK-422 and the two crewmen were taken to the infirmary and perished in the Death Star's destruction during the battle of Yavin 4. In the novelization of the movie, and in Star Wars: Galactic Battlegrounds, the trooper was referred to as THX-1138, a homage to George Lucas's first feature film. In the radio drama, he was referred to as TX-421. In Star Wars 3: Death Star! the character is referred to as TX-421 and as part of Scanning crew BT-445. In the German synchronization of Episode IV, the trooper's designation is TK-241 instead of TK-421. In the video game Star Wars: Jedi Knight II: Jedi Outcast, the character TK-664 is a direct reference to this character. In the game TK-421 is also the name of the player skin of a stormtrooper, selectable in multiplayer. 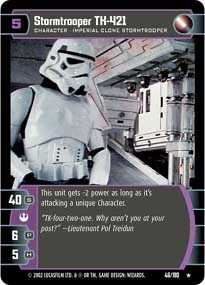 In the Star Wars: Battlefront series, TK-421 is one of the random names given to Imperial bots. Star Wars 3: Death Star! ↑ Star Wars radio dramatization, Episode 11: "The Jedi Nexus". ↑ "BT-445", Star Wars Encyclopedia, page 37.